Vietnam is still confident that they will advance to the semifinals of the men’s football at the 27th SEA Games despite of their 1-0 loss to Singapore yesterday. 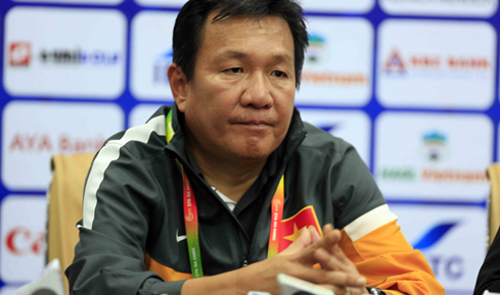 Coach Hoang Van Phuc of Vietnam said his team will have two more games against Laos on Dec.15 and Malaysia two days later. The only goal of yesterday’s match was scored by Sahil Suhaimi in the injury time of the first half from a corner kick. Suhaimi shot the ball to Vietnamese center defender Manh Hung, making it divert the direction and fly into the goal at the surprise of goalkeeper Buu Ngoc. Vietnam formed an attacking formation from the beginning but failed to score because of the impressive defense from Singapore. Coach Phuc and other Vietnamese football experts admitted that it was a worthy victory for Singapore. After the loss, Vietnam ranked second in group A with three points after Singapore, with four points from two games. In the other group A match yesterday, Malaysia beat Brunei 2-0. Nguyen Phuc Nguyen Chuong, a former Vietnamese international footballer and youth football coach, said Singaporean players are not strong in dribbling the ball but they make up for it with their strategic minds. “It’s boring to watch them playing but difficult to play with them,” Chuong said. Vietnamese player’s performances during the game didn’t reflect strategic minds, but did show an unprompted style of playing football. The ball that turned into the goal was shot high, flying past Vietnam’s goal and nearly reaching the other corner. But a Vietnamese defender hastily tried to clear it away by heading it hopelessly, and the ball flew back into the middle area in front of the box. Suhaimi received the ball and made a shot which was not dangerous, but another Vietnamese defender intervened by spreading his leg wide to stop the ball. It made the ball divert its direction. Without the intervention, Vietnamese goal keeper Buu Ngoc could definitely have held on to the ball. In short, the goal was scored thanks to the contribution of two of Vietnam’s defenders. This is not just a loss of players, but also a loss of the mastermind and coach Phuc, who failed to implement any effective strategic solutions to help his players overcome the rivals and pierce through their defensive wall reinforced permanently by no less than five players.